The NAFTA-USMCA agreement announced by the US and Canada has been claimed as a victory by both Donald Trump and Justin Trudeau; but for working people, this deal only tightens the corporate handcuffs. 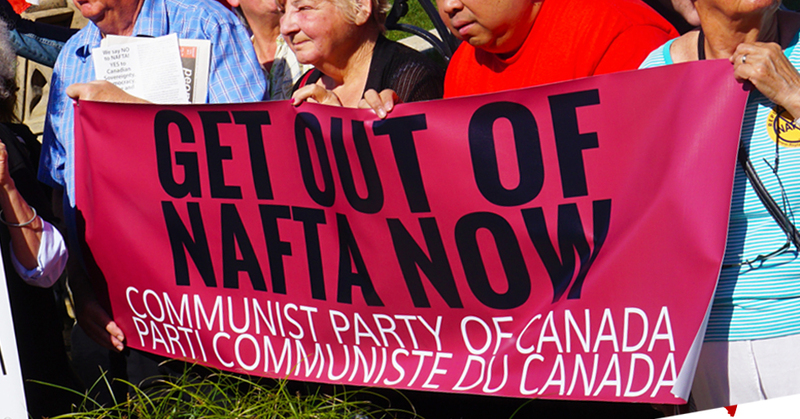 The Communist Party of Canada calls on Parliament to refuse to ratify the USMCA, and we urge the labour and democratic movements to mobilize against this sellout of the interests of working people and farmers in Canada. Some critics have expressed relief, arguing that the USMCA “could have been worse”, pointing to details such as the removal of the investor-state dispute settlement mechanisms (ISDS) which have allowed corporations to sue Canada for environmental regulations which result in an alleged “loss of expected profits”. But taking the USMCA as a whole, the sharply negative features far outweigh a few such gains. In fact, ISDS has been replaced with other provisions that attack sovereignty and independence and further entrench corporate power. There are no gains here for working people. This includes the fact that the steel and aluminum tariffs imposed last June against Canada, threatening the economic well-being of tens of thousands of Canadian workers, remain in place at the whim of the US president, on the fabricated excuse of “national security.” The extension of drug patents to ten years from the previous eight will make it more expensive for people in Canada to get cheaper generic drugs, and more difficult to implement a national pharmacare plan. Dairy and poultry producers are facing new threats from the sections of this deal which open the domestic market by another 3.59% share for US products, and restricting Canada’s exports of cheese and milk products. This attack on supply management is the latest step in the longer historic trend towards agribusiness control of food production, the reduction of family farms, and the loss of jobs. Even the much-vaunted “protection” of the auto sector, the single most important manufacturing industry in Canada, has been greatly exaggerated. The terms of the deal leave open the option for new US tariffs on cars made in Canada, above a production level of 2.6 million vehicles, effectively preventing any future expansion of the industry. There is also an upper limit on auto parts production before tariffs can be triggered. Perhaps the single worst feature of the USMCA is Article 32.10, the “non-market economy” clause which removes Canada’s sovereign right to reach new economic agreements with countries including the People’s Republic of China, which has the fastest growing economy in the world, but also Vietnam and Cuba. The intention is to lock Canada permanently into the US military-industrial complex, playing the role of supplier of raw materials to US imperialism, instead of moving towards policies of multilateral, mutually beneficial trade with other countries. The Communist Party calls to reject the USMCA as a direct attack on working people, and against the sovereign rights of Canada to determine its own economic and foreign policies. The outcome of the renegotiation talks proves that a so-called “better deal” was never on the table, and in fact that the “progressive” rhetoric of the Trudeau Liberals was simply a cover for making new concessions to the demands of the Trump administration. Our opposition to NAFTA/USMCA is not based on the phoney arguments of “economic nationalists” who falsely pose the interests of Canada against those of other countries. In our view, the interests of workers in all three NAFTA/USMCA countries are the same: the need for better jobs, higher pay, good social programs, and immediate action to stop climate change. These deals, like other neoliberal trade agreements, have never been intended to protect human rights or the environment; they are always focused on the “right” of big capital to achieve maximum profits by removing restrictions on corporate investments. Like NAFTA, the USMCA is a tool for transnational capital to step up its exploitation of workers and resources in all three countries. The only way to fight back against the neoliberal, austerity agenda of big capital is to build much stronger united action by the working class of the US, Mexico and Canada. Tell Parliament: cancel the USMCA! Demand a new trade policy, based on multilateral, mutually beneficial trade with all countries!